Your little prince or princess deserves the best, right? Absolutely! I try to give my son the very best of everything – within reason – and take care and caution about what he eats to the cleansing products I choose for him. I recently heard about a cool haircare line for kids called Hot Tot. There are three key reasons I am in love with this collection: the ingredients, the packaging and the price. Hot Tot Haircare…made just for kids. Who wants to expose their children to harsh chemicals? Or potential allergens? No one, of course. But everyday shampoos and such can contain that stuff. Hot Tot is safe, works great and is especially made for kiddos ages 2-10. The line is pediatrician & dermatologist tested, hypoallergenic, cruelty-free, water soluble, containing no soy, gluten, peanut or dairy. Ingredients are free of parabens, formaldehyde, mineral oil, artificial color and other junk that could be harmful to your babe. The packaging is to die for! It is so classy and super chic. Clean white bottles (that are BPA-free, recyclable and fully biodegradable) mix with shiny silver writing and accents for a modern look. 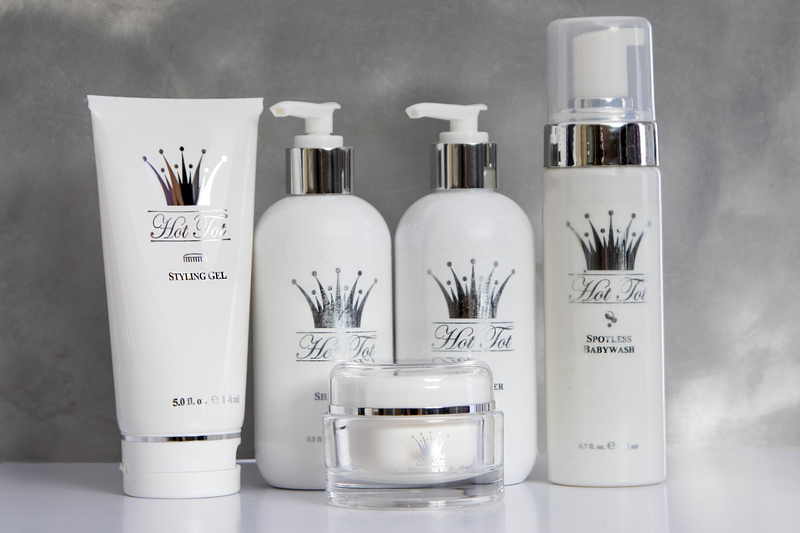 And each product is adorned with a crown to add a royal touch. You can stylishly display these babies on a bathroom sink or counter. Price is important. Children are constantly growing out of clothes and shoes, needing new things…who wants to then spend a lot on their hair? I don’t, but I still want high quality. Hot Tot is really reasonably priced. And a little goes a long way so you won’t be constantly running out or having to buy more. Hot Tot is cool for kids. Beyond shampoo and conditioner, there are fun products to create trendsetting styles, like the Structure Whip and Styling Gel. Oh and one last thing…the scent…a soft blend of baby powder and marshmallows. I heart everything about this line! Do you? This entry was posted in haircare, kids haircare and tagged kids, kids hair, kids shampoo. Bookmark the permalink.